For ages 3 - 6. 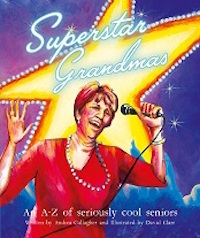 An A - Z of seriously cool seniors featuring a rhyming alphabet of characters based on the lives and faces of real grandmas. Grandmas are great, nannas are fun. They're all so different ... who's your favourite one? Great idea - should be a winner Andrea!